August 29, 2005 in the morning hours, Hurricane Katrina made landfall on the Gulf Coast. It registered as a Category 3 storm, winds were 100-140 miles per hour and stretched over 400 miles. It was a monster. My family was blessed to have little to no damage. Mobile was not a direct hit, yet communities in the neighboring counties were devastated. Even though we escaped the worst of the storm, we were without power for a week. Thankfully we had clean water, many were not as blessed. I remember sitting at my living room window and watching the rain and wind blow. In previous years we had evacuated for several hurricanes and decided early that we would stay home for this one. Based on the information Katrina wasn’t going to be a direct hit for Mobile, and it wasn’t. We had a supply of food, water, and batteries. The windows were taped or boarded in most rooms. Tree limbs were trimmed and everything that wasn’t tied down, literally, was moved indoors. I watched the morning it came on land as Katrina knocked out the power and a tree in our yard. Thankfully it fell on the street and not our house. That was the extent of our damage. We spent days picking up debris, but that was it. We were blessed. My husband had an old battery operated TV, that had an antenna to pick up local stations. We watched a few spotty reports and saw the devastation that followed Katrina in New Orleans. A natural disaster made worse by man made tragedy. The levees didn’t hold. Katrina was worse than Camille. I’m too young to have lived through Camile, but I grew up hearing about the horror. I remember driving the short distance to check on my in laws and telling them what we saw on the news. They just nodded their heads and said, “No, it can’t be worse than Camile.” When the power returned we witnessed just how horrible it really was. That’s the thing about hurricanes. The memory builds in your mind and becomes, like a person. I won’t go into a play by play of the storm, news agencies are doing that on their own. Nor will I assign blame to groups or agencies about the handling of the aftermath. It’s easy to see what should have been done after the event. I pray that lessons have been learned so that we don’t have a repeat performance. Because honestly, there will be another monster storm. Before Katrina there was Camile. Camile was the hurricane that all other hurricanes were measured by. Now that, I won’t call it an honor, goes to Katrina. New Orleans was a tragedy I pray is never repeated. One lesson I hope everyone learned was, do not depend on government agencies to protect you. You must prepare before the storm hits. Click here for some pictures from NOAA. LiveScience has a great article on the hurricane itself. New Orleans is about 2 hours from Mobile, roughly 144 miles. The damage, flooding and problems caused by Katrina wasn’t limited to just New Orleans. It was a regional catastrophe. 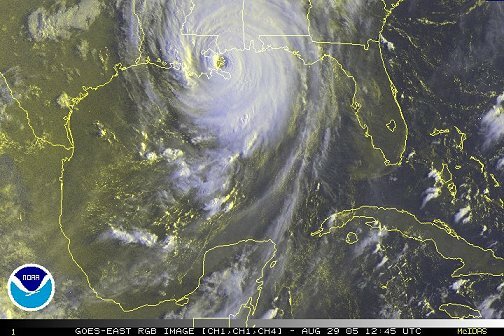 Katrina made landfall on the Mississippi/Louisiana coast. A little town called Waveland, Mississippi was hit very hard. Here are two very good articles.click. click. Closer to my home is a small fishing area called Bayou La Batre. This area survives on commercial fishing. Katrina tossed the boats around like toys. Click. If you scroll down to the bottom of the page you will see photos of Mobile under flood waters. Why Waveland? Why Bayou La Batre? Because Katrina wiped out dozens, if not hundreds, of tiny little towns along the coast. Not just New Orleans. As you watch the film footage and the reporters talking about Katrina. Don’t forget there was an entire coastline affected. Millions in over three states lost family members, friends, houses, jobs, and businesses because of Katrina. It has taken years for all of these areas to recover, some are still trying to recover, and others never will. We are still in the midst of hurricane season and the last few years have been very quiet. There are a few storms in the Atlantic, but they aren’t a threat… yet. It’s this calm that gets you. You forget how devastating a hurricane can be. Forgive any typos, I’m writing this in a rush. I had planned on using today to work on my synopsis and plotting Book #2 for NaNo….but like most times, life had other ideas. I have family coming over for dinner so I must clean house and cook. The family has been quite indulgent of late with me ignoring everything but dishes and laundry. There are things I must do today. SO on with it. Hurricane’s are just part of living in the South. It’s not a matter of if they will hit, but when. Thankfully, we are usually given a few days warning. Hurricane season runs from June 1st to November 30. That’s a long time. Hurricane’s are a part of life. We learn to adapt. The first hurricane I remember occurred September 12, 1979. I was 6 years old. I vividly remember packing up the car and driving with my family 45 minutes north to Citronelle, to avoid the storm. The prediction was the storm would head into Mobile Bay and straight up the state. Citronelle would miss most of the storm…. not exactly. Hurricane Frederick came ashore 10pm over Dauphin Island as a category 3, winds up to 145 miles per hour. We were not far enough north. That night I remember the winds, possibly a tornado, pick my grandparents house up. It could have been worse, a lot worse. The next day we made our way home. Our house was still standing. Amazingly, 3 very tall pine trees were knocked down in the storm, none of them hit our house or those of our neighbors. It was a miracle. Around here, pine trees are the first to be cut down when you move into a new house! We had only been there for a few weeks before Freddie hit. The fun was just beginning. We spent a month or more without electricity. Unlike some, we still had clean water. What I remember most was an odd mix of excitement and fear, before the storm. I could see the nerves of my parents and grandparents. I didn’t really understand what was happening. I just knew it was a big storm. Afterwards, the days were filled with the hum of chainsaws and the clopping of axes. School was out for ages. The TV didn’t work, so the kids were left to climb on fallen trees, board games, and exploring the neighborhood to checkout the debris. For the first few days, food was awesome. We had to eat everything in the freezer, before it went bad. Dad cranked up the grill and tossed everything on it. We grilled meat, as well as veggies. After that, it was dry cereal and sandwiches until the power came back on. We couldn’t go fishing, too much debris in the water and roads close to water were washed out and had to be rebuilt. I remember loading up in the truck with my Dad to get ice or gas. Both had lines for blocks and took an eternity. We got by. To a small child, there was a hint of adventure about it. As an adult, with children, I see hurricanes differently. By the time my oldest was 3, we had evacuated for points north 5 times. We stayed for Katrina. I remember watching the pear tree in my front yard bend until it finally came straight out of the ground. We didn’t have much damage from Katrina. We live on higher ground with no close bodies of water. Others in the county, and surrounding states weren’t so blessed. Funny thing about hurricanes, they become markers in time. Some storms are quickly forgotten, they rush in, bluster a bit, and fade away. Others, leave lasting impressions. My parents generations measured everything by Hurricane Camille (1969). I measured everything by Hurricane Frederick. Those hit hard in 2005, measure by Hurricane Katrina. Do you have any Hurricane stories to tell?